For some reason they never wake easy. I poke, I prod, I move limbs. They are like bumps on a log. Every now and then, though, I throw open the curtains and state quite loudly "hello sunshine!". If I'm lucky, they'll slowly open one eye, then the other, and then they mutter...Mutter about it being too bright, but alas, they are awake and moving! Mission accomplished! All Things Unity is having a Style Challenge. I grabbed the only Unity Set I had and went to work, trying to come up with a graphic, non cute-sy design that doesn't focus on the frog in the set. 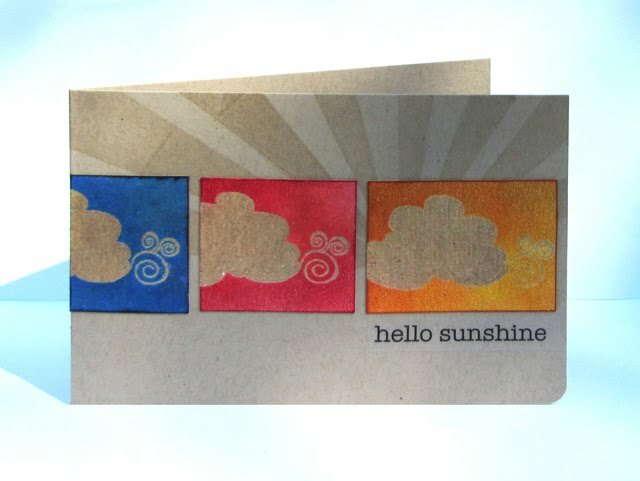 I first clear embossed the clouds on kraft paper and then colored the exposed areas with ink. I've never tried this technique before and quite like it. Suites my clean and graphic style. 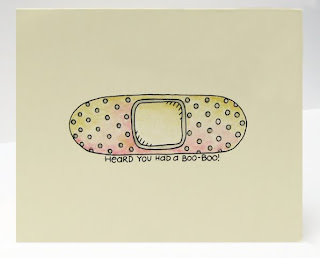 I'll be giving this to someone as a get well or thinking about you card...someday. 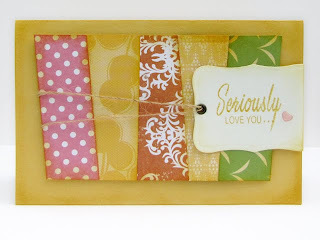 Ooh, and did you see the blog candy offered up by The Button Junkie, SherryAnn? Find out about it here, it's amazing. A clean and simple card created for the Aspiring To Create Challenge where we were to use a photo as inspiration as well as a supply or tool that you own but have not used before. A while back I found a tracing wheel at a local thrift store to create the faux stitching technique and can't believe I hadn't tried it out until now. So much fun! (By the way, Teri Anderson's tutorial is here! 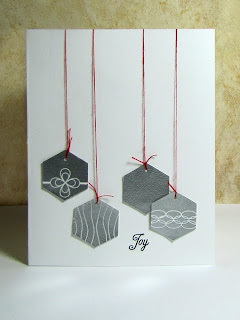 )The polka circles were stamped with the polka hexagon from Schlosser Design's Hexagon-A-Thon set and simply punched out. 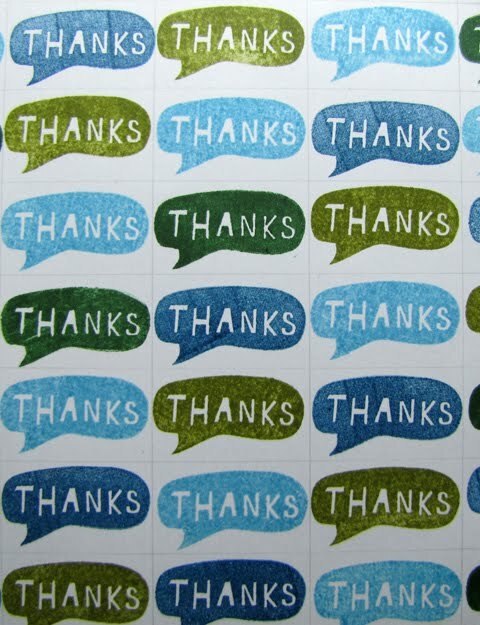 Love that these stamps can take on a different look and even shape. 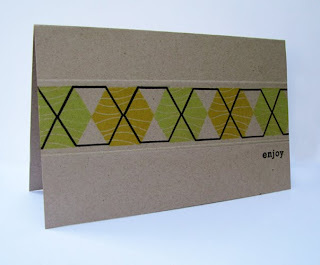 Here's a quick tutorial on how I create stamped background paper with a grid design. 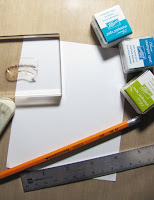 Start with the basic tools and your favorite stamp that you'd like to use for a background. For this technique, I try to use one that it a bit smaller and not so busy as to be distracting. This card uses the cute Thanks Stamp included with a purchase from Lawn Fawn (which are available at LimeLIGHT Papercrafts)! Measure your stamp. Transfer the width and height to the paper by creating a grid with light pencil lines. My spaces ended up being 1 1/4" x 3/4"
Stamp your image repeatedly within the squares. Trim and adhere your card. 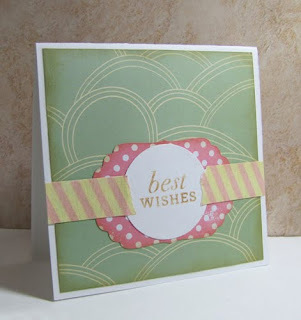 This technique works especially well with a circular image and a single stamp color as well (as seen in my card here). 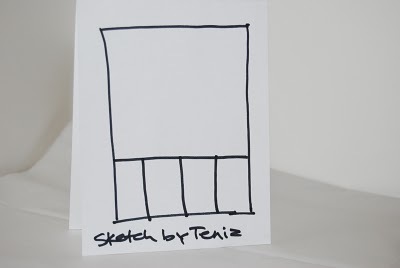 I would love to see what you come up using my version of the stamped grid background technique-please post to your blog and copy the link in the comments fields on Yvonne's blog! Many Thanks to Yvonne for having me as a quest designer on her blog today! Can you watch a baby discover the joys of stacking items over and over again? I think about the skills that they are developing with just a few objects and am simply amazed. I think most of our fine motor skills were developed with the simple building block, and that today, as adults, we still can learn from building blocks. 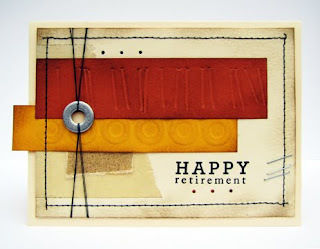 He could officially count himself as one of the retired folks. He worked hard all his life. He punched the time clock day after day, gave it his all. He was ready to relax... he had a whole garage full of wonders awaiting his attention. Another quick post for me-this was a card I made with the Gallery Idol Challenge in mind (use items from garage). 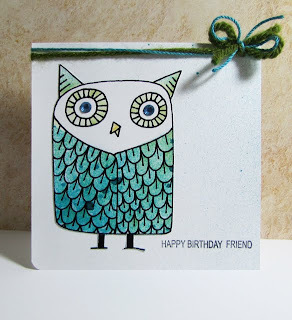 I loved the results that the dry embossing achieved but passed it over because the overall design was just a bit too busy for my liking. This was the day that I trusted myself and submitted what I liked. A quick thank you too, for all your kind words. Still working things out but I'll be back to visit all of you soon. Hey all! Wow, long time no post for me. I think there will be couple more days like that. Going through a bit of a rough patch! 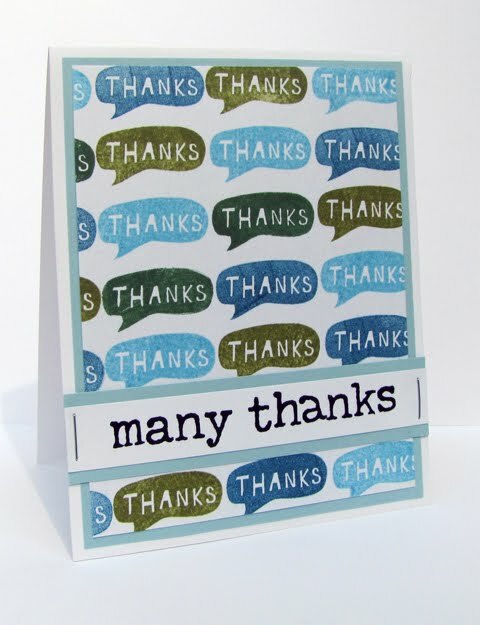 I hope to catch up in a few days and thanks for "sticking with me"! 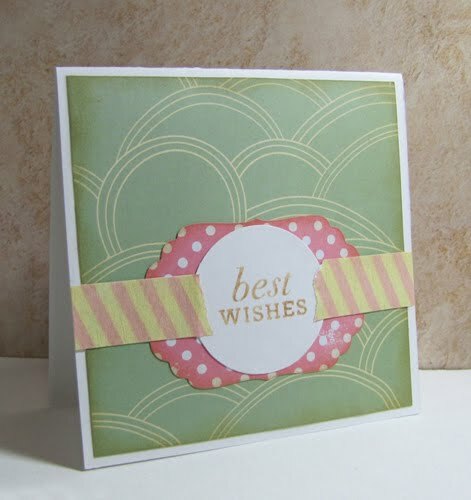 Just a quick one layer card that seems to be appropriate right now. Search "hexagon" on Google and you end up with a yield of about 6,990,000 results 0.39 seconds. This little shape is truly amazing, and worthy of that many entries on the world wide web. 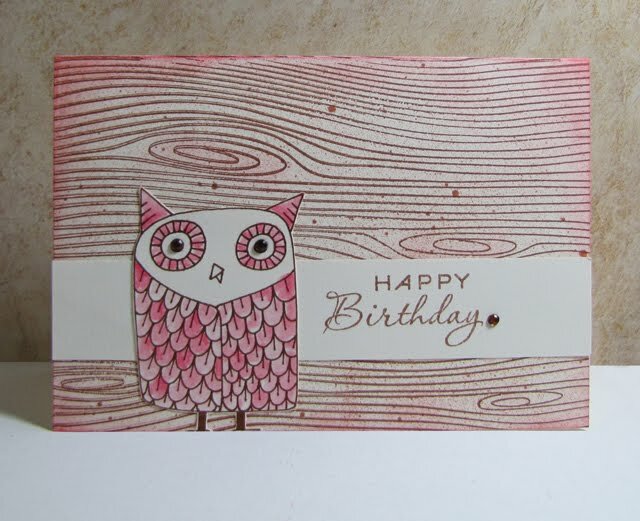 Throw in some awesomely trendy patterns such as wood grain, and its this clean and simple cardmaker's dream stamp. This one layer card created for the Happily Ever Challenged Challenge consists of three stamps: the woodgrain hexagon from Schlosser Designs stamped in a row in two different colors-sides touching, the outline hexagon from the same set stamped to overlap, and a simple sentiment. I scored a line at the top and bottom for a bit of visual interest. 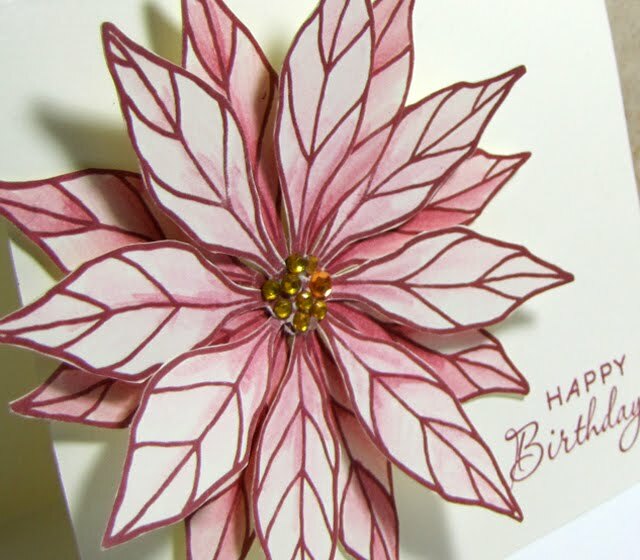 This design allows you to switch up the patterns and colors for a completely different kind of card. 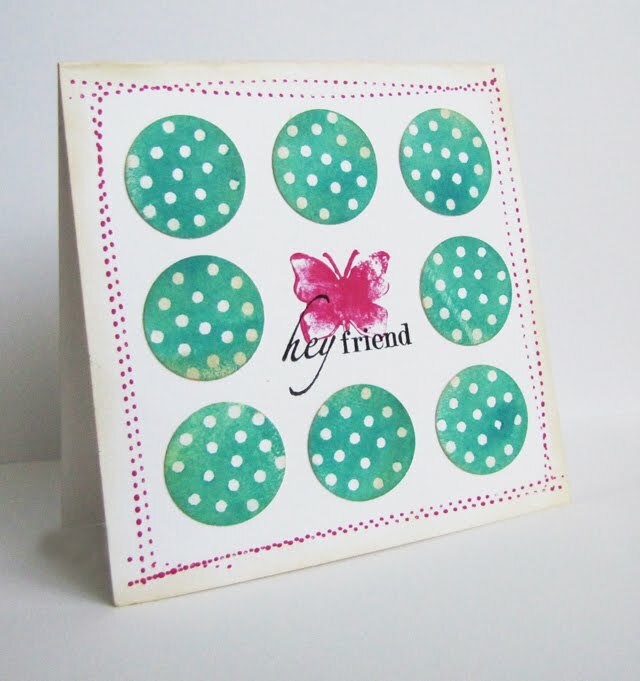 For instance, switch to the hexagon polka dotted stamp and stamp in light greens and purples, add a touch of light brown and you have a baby or little girl's birthday card. Recently I shared a wonderful visit to the zoo with my boys, my sister and my mother. At the end of the long day, when the boys were worn out and we were getting cranky, we meandered to one last exhibit-the butterfly exhibit. We entered a screened enclosure painted like a monarch caterpillar and all around us flew thousands of butterflies. Big ones, small ones, colorful ones, monochromatic ones. So pretty, so wonderful. Even the boys were amazed, and that was something considering they had just seen it all! 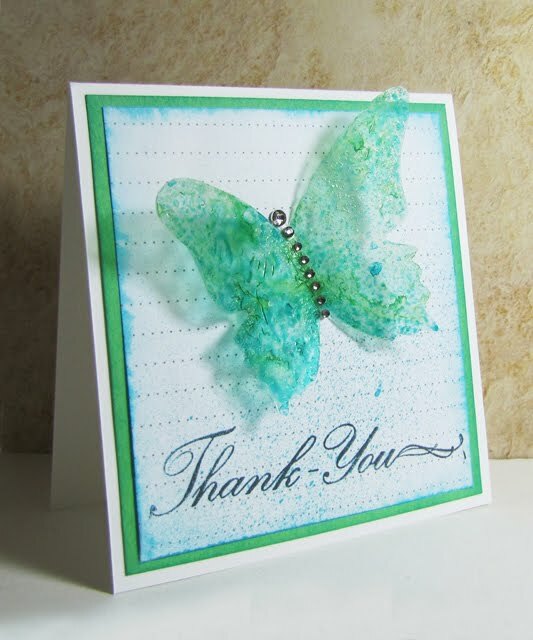 A very talented card designer and I were just corresponding that we have missed butterflies around on the blogs. And we've decided to Bring Back the Butterflies! 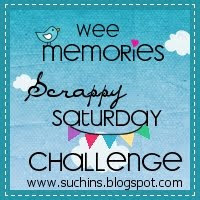 Easy to do, since the latest challenge from Wee Memories is to incorporate a butterfly. Simon Says Stamp & Show is also having a challenge for Things with Wings! I've created mine using some acetate, Glimmer Mist and Glossy Accents. Still trying to work out the glitches with the mist and I thank you for partaking in the journey with me. I've got a few younger cousins that are just about at the marrying stage and this card would be for one of them. 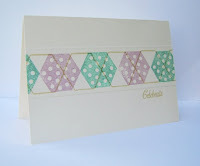 Lots of patterns that are fresh, funky and fun. Not a lot of fuss, to the point. 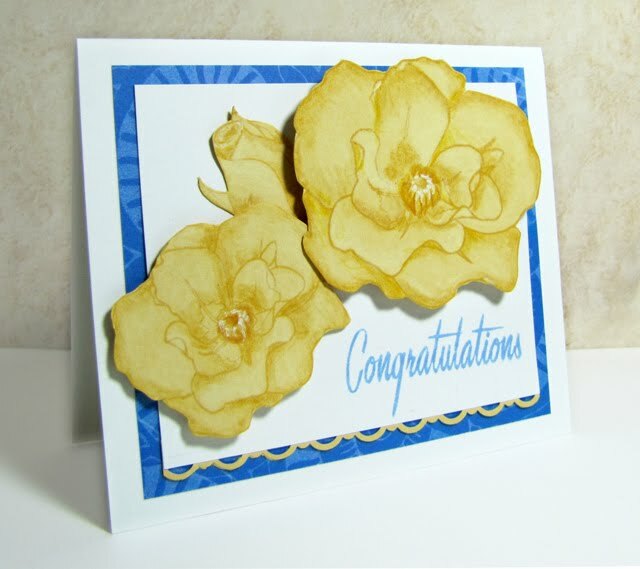 The colors for this card came from the inspiration photo collection at the Off the Wall Craftiness Challenge. 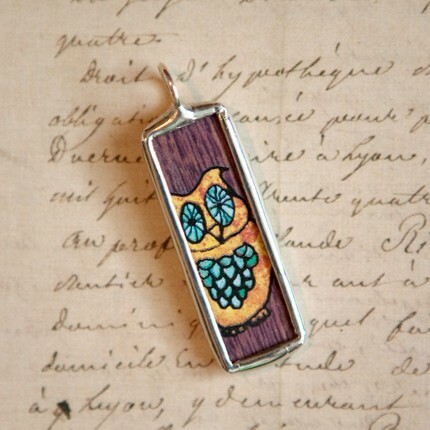 I've been loving decorative tapes lately. Actually, a few things I've used lately that I thought I'd share quickly with you, if you are interested in knowing. 1. Decorative Tapes: Straight lines every time, no adhesive required. Bold or petite patterns. 2. Glimmer Mists: Love the effect. 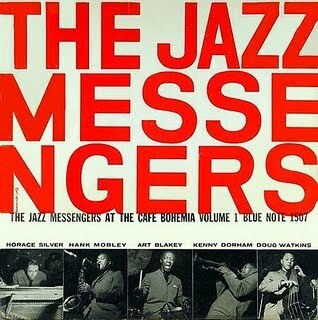 Still working hard at mastering it. A bit of a mess but cool results. 3. 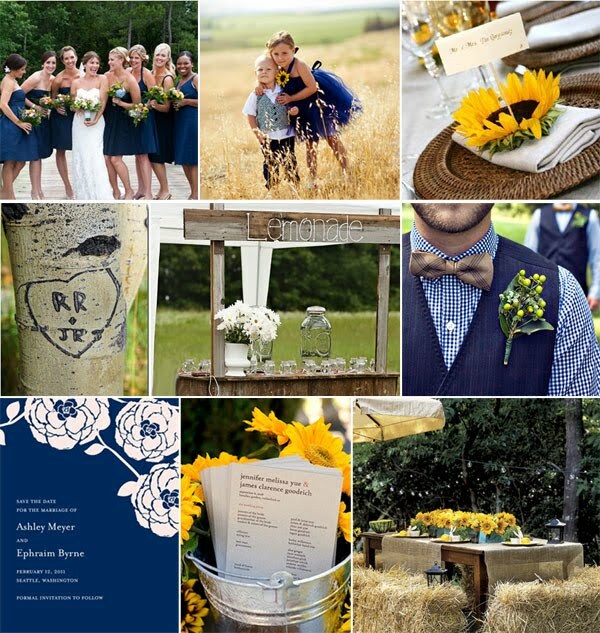 Rustic Twine: Love the color. Love the thickness. Not too crazy about the little hairy things all over it. 4. Ranger Craft Mat: This thing is what they say it is. You can ink, heat, glue, drool on it if you want too. Anything wipes off. 5. Antique Linen Distress Ink: Possibly thee best distress color-not too light, not to dark. 6. 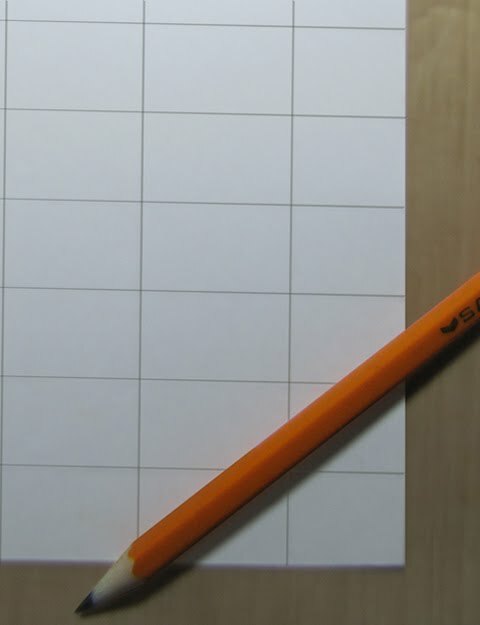 Uniball Signo White Gel Pen: Hands down the best white pen. Nice thick coverage. Not too thick of a line. Need about ten more of these. 7. 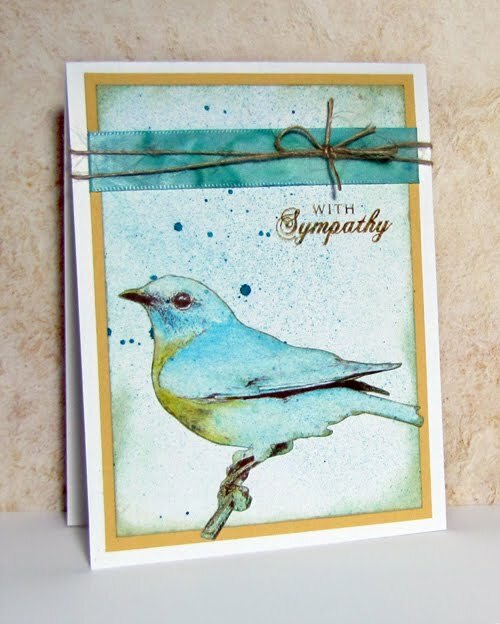 Birds: Digital birds, stamped birds. Graphic birds. Realistic birds. Just anything birds. I think they are cool. So now I can finally post that it is Amy's Birthday and I'm sending her some well wishes today! (I screwed up with my pre-posting yesterday, ugh!) Happy Birthday Miss Amy! Amy Tsuruta was one of the first designers I followed when I started my blogging journey. She's got such a kind soul and has left encouraging comments for me time and time again, and I can't thank her enough! Amy caught my attention with her use of patterned paper, and she still amazes me to this day of the wonders she creates-both in cards and scrapbook layouts. Fabulous eye for patterns, colors, sewing, embellishments, the list goes on! Pop on over to her blog Tsuruta Designs and wish her well today! 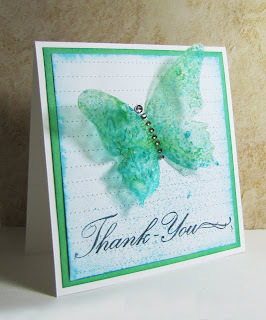 Still trying out and practicing with the new Glimmer Mists that I purchased from Practicing Creativity Designs. I decided to make two owl birthday cards because, well, I still wanted to surprise Amy (the surprise being which one is actually sent to her!). The pink card was inspired by this pendant at Cathy Walter's Etsy Shop for the Etsy Inspired Challenge. 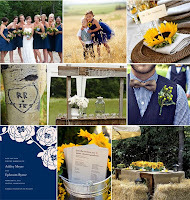 I have the great honor to be on the Schlosser Design Team with with Amy, as well as Laurel, who is having some awesome blog candy right now! Rays of sunshine can take on many forms. 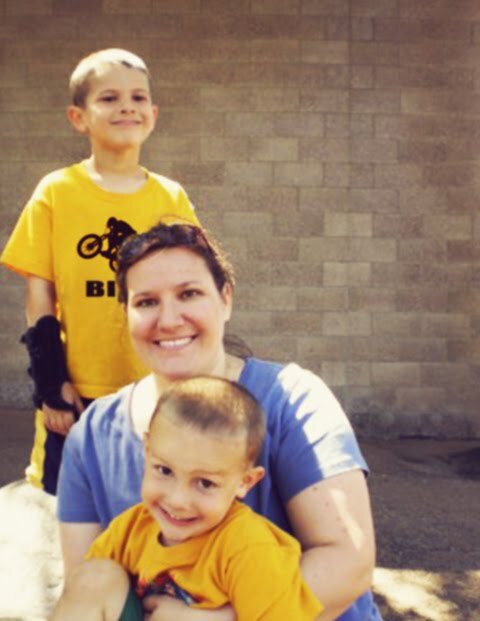 Like my little boys, my husband, my family. Like new puppies, or a nice gesture by a complete stranger, a comment left on my blog or forgiveness for an honest mistake. It can be a hug from a grandparent, or a good meal shared over raspberry lemonade with a good friend. What's your ray of sunshine? 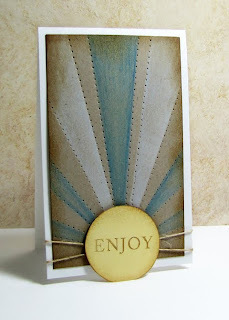 Just a quick card using two Practicing Creativity Design sets-You're Dandy and The Whole Cycle. I created a mini field of flowers with the tire and spoke stamps, and used the wagon wheel for the stems. Bluebirds. Peace consumes me when I see the bright glint of their blue wings flirting with the sunlight or when I am privy to see the couple sharing an afternoon rest on a telephone pole together. Yes, bluebirds are very special to me indeed. I rather think of them as my guardian angels. The inspiration picture at The Shabby Tea Room Challenge inspired me to pull out my new Glimmer Mists that I had purchased from Practicing Creativity Designs and I also wanted to try out this bluebird image from TiffanyDoodles. 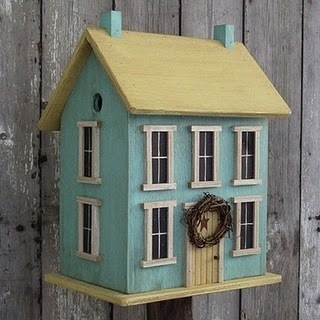 I really enjoyed the colors of the bird house and rather going with the house, I went with the bird. After printing the bird image, I sprayed it with the mist, colored him and cut him out. I adhered him onto a panel that had a bit less misting and finished the card with ribbon that had also been altered with the glimmer mist. Decorating the tree was always an exciting event when I was little. We always had a live tree (why oh why don't I do that now?) and it would take a bit of time to fill it full of decorations. Not the matchy-matchy ones but ones that had meaning. The best ones were saved for last and they were the beaded icicles, as we called them. We'd hang them by the little colorful lights and they would make the whole tree glimmer and shine. Silver embossing adds a lot to a card but dang, it is hard to photograph. Let's overlook that part shall we? This card is based off the sketch and colors at Jazzy Paper Designs, in which Schlosser Designs is sponsoring! For this clean and graphic card, I started by stamping the smallest of the hexagons from Hexagon-A-Thon by Schlosser Designs with watermark ink and then silver embossed them. After punching holes in both the ornaments and card base, I strung them with red thread. Sigh. There's just something about tricycles that make me think of babies, and makes me smile so. 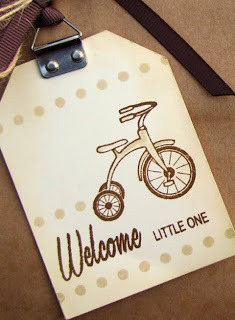 I instantly fell in love with the nostalgic tricycle image from The Whole Cycle and the combination of the two sentiments within Chatterbox are a perfect match. 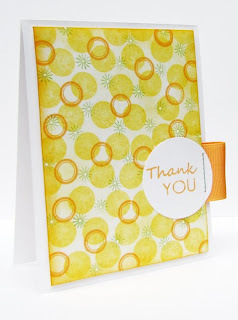 Whimsical dots from For the Love of Dots (a previous release from Practicing Creativity Designs) were added to both elements for dimension, and the color scheme reinforces my take on nostagia-the ensemble takes on an aged, vintage vibe. I think it would be most fun to use pink or blue tissue to specify the gender. The Whole Cycle and Chatterbox will be available tonight at midnight (August 5th) along with some fabulous fabric tapes that Courtney now carries at Practicing Creativity Designs! Thank you for taking this journey with me as I help to release these two fabulous sets, I hope you've had fun. 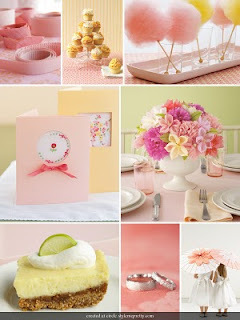 Please take a minute to check out the blogs of Dana, Paulina and Courtney for more creative ideas using the new releases! It's my opinion that persons born in the last month of the year have it rough. (My little boy was welcomed into this world one day before Christmas). Here are a few things I've learned: Wrap birthday presents in birthday wrapping paper and Christmas presents in holiday paper. It's important to have a birthday cake on the 24th and sing happy birthday, no matter how busy you are this day. My most favorite holiday song will forever be Happy Birthday. 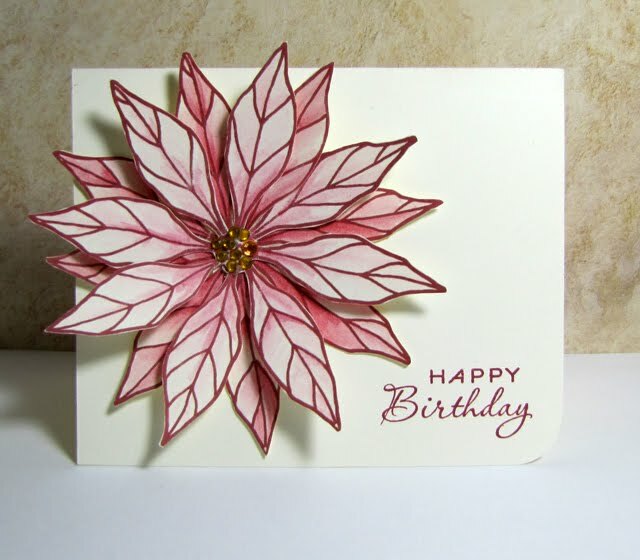 When I saw this gorgeous pointsettia image from Jane's Doodles, our awesome sponser this week for the CAS-Tastic Wednesday Challenge, I knew I was going to create a birthday card. Something special for those December birthday people. 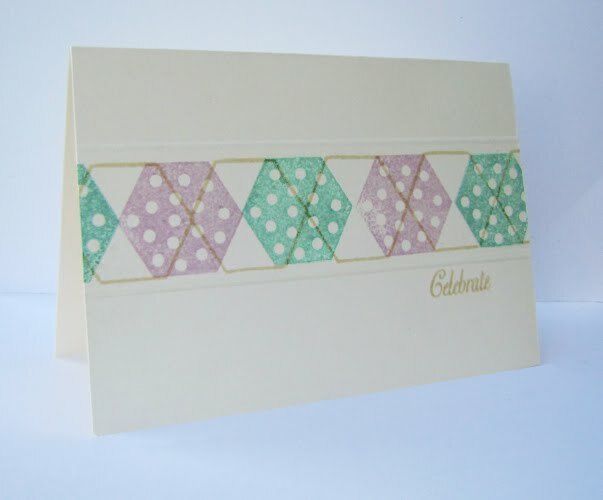 Super simple to create-I just printed it twice in colored ink, added filler color lightly with blender pens, cut and layered and added some gems in the center. You won't want to miss this challenge, as Jane has offered up some of her digital images and a set of her handmade buttons to one random participant! Chatterboxes. Yep, I've got two. Built right in and no way to pause them or turn down the volume. They say the funniest and most insightful things! Sometimes you can make them run longer by giving them sugar, and the only way to turn them off is when they go to bed. Yep, two little Chatterboxes, my two little boys. Sorry, these chatterboxes are not for sale, as I love my chatterboxes to pieces. Chatterbox. 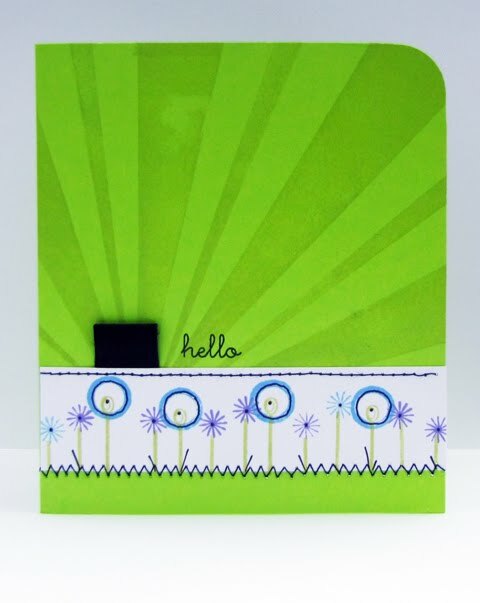 Perfect name for the second stamp set being released this month by Practicing Creativity Designs! This stamp set has a ton of modern and classy large words and even more small supplement words. Trust me, this set fills a lot of gaps in the stamping world and you can mix and match and never get bored! Please head on over to Dana's and Paulina's blogs for more eye candy, and then stop by Courtney's where she has a super great video and for a chance to win it! I've checked them all because they are a few of my card making goals. Being able to do all of these is tons of fun, quite easy and quick with the newest release from Practicing Creativity Designs, seriously. For the background on this card, I used just two stamps (the outlined circle and the starburst/spokes) of The Whole Cylce, some ink and a solid sheet of plain white cardstock. To achieve the look, I started by turning the outlined circle stamp over and stamped with the backside and then with a different colored ink I stamped on the correct side. 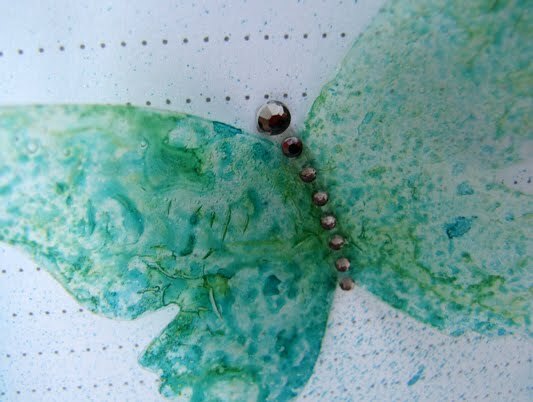 Then I stamped the spokes and gently sponged the lightest color of ink over the entire piece. As a final touch, I highlighted the center of each spoke with a dot of white gel pen. and Courtney as well, who has even more details for you! Today I have a wee bit of a clue for you regarding the August release. 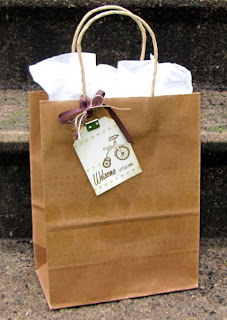 Look carefully at the picture and then hop on over to the other Practicing Creativity's Design Team member's blogs of the talented Dana and Paulina for clues in their pictures. Finally, stop on over at Courtney's blog and place your guess on what the really awesome new release is all about for a chance to win it! Fun right? So, without further ado, here's my picture and following is a new quick and simple card I've created using my all time favorite PCD set, You're Dandy. 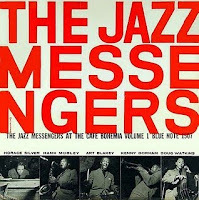 (Although this new release might top that!...) The front of the card is cut a bit shorter than the back so that the front rests on the sun. 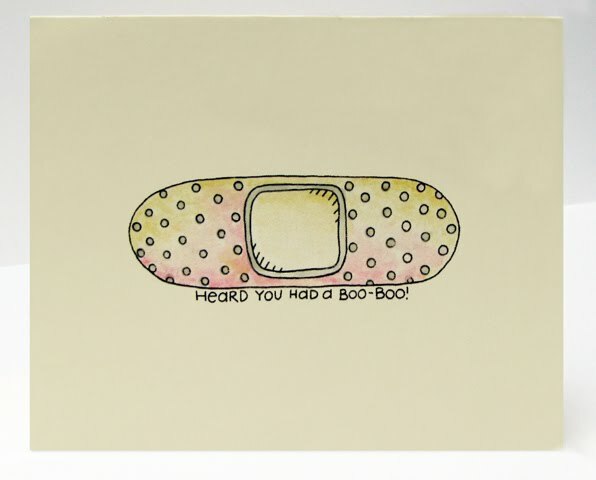 I was really inspired by this card from Paulina. 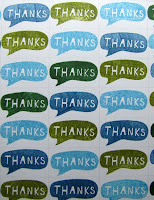 Supplies Used: Cardstock: (White) Georgia Pacific (Barely Banana) Stampin' Up! (Kraft) Papertrey Ink Stamps: (Rays from You're Dandy) Practicing Creativity Designs (Sentiment from Mega Mixed Messages) Papertrey Ink Ink: (Antique Linen Distress) Ranger (Fresh Snow Craft) Papertrey Ink (French Blue, Ice Blue Chalk) Clearsnap Other: (Rustic Twine) Papertrey Ink (Colored Pencils) Prisma Color Tools: (Circle Punch), (Paper Piercing Kit) Stampin' Up!